Futurebox—DTU Science Park’s new innovation initiative—welcomes its first partner, Jyske Bank. A unique partnership, which will ensure the best development and growth conditions for Futurebox startups. In May, DTU Science Park will open the doors to its latest innovation addition —Futurebox. Futurebox is a hardware incubator and accelerator for startups and spinouts from the universities, focusing on the development of high tech and hardware. In addition to buzzing with startup life, Futurebox will invite established enterprises to engage in valuable collaborations with startups. With Jyske Bank as Futurebox partner, startups in Futurebox get unique access to financial consultancy and sparring. At the same time, Jyske Bank gets closer to the startups and can help with challenges faced by hardware startups during the various stages of development. “We are extremely excited to welcome Jyske Bank as our first Futurebox partner. Firstly, Jyske Bank will be able to provide crucial sparring for new startups in Futurebox, and at the same time, we believe that we can establish valuable collaborations between the high tech and hardware startups working in Futurebox and Jyske Bank’s customers,” explains Lone Gammelgaard Schwarz, Head of Futurebox. Futurebox wants to attract the best startups and create a dynamic and entrepreneurial community for high tech development. 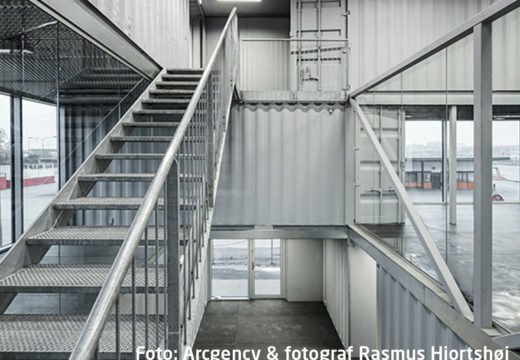 The physical framework consists of 16 containers—a total of 1,600 square metres of co-working space, meeting rooms, and a brand new prototype workshop. All located on the DTU campus with close access to DTU’s researchers and the many innovative companies at DTU Science Park. Futurebox is DTU Science Park’s incubator and accelerator for hardware startups and spinouts. DTU Science Park is wholly owned by DTU and is Denmark’s largest science park based in both Lyngby and Hørsholm. A total of 260 innovative companies—primarily in the fields of biotech and hardware—are based at the science park, and every day 3,400 employees go to work there.